Type 1 diabetes is a well-understood autoimmune disease. Autoimmune diseases result from an immune system-mediated attack on one’s own body tissues. In normal development, an organ called the thymus introduces immune cells to the body’s normal proteins. This process is called negative selection, as those immune cells that recognize normal proteins are deleted. If cells evade this process, those that recognize normal proteins enter into circulation, where they can attack body tissues. The thymus is also important for activating T-cells that recognize foreign proteins. 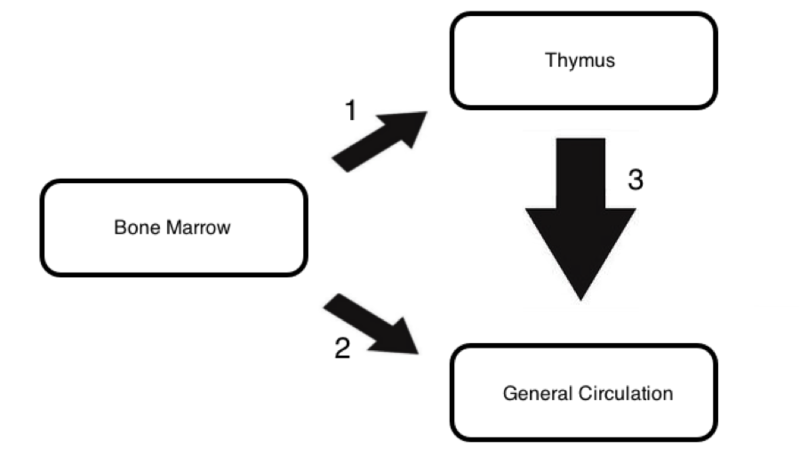 As the figure below shows, immune cells typically originate in the bone marrow. Some immune cells, called T-cells, then go to the thymus for negative selection. Those that survive negative selection, enter into general circulation to fight infection. Other cells, called B-cells, directly enter general circulation from the bone marrow. It is a breakdown in this carefully orchestrated process that leads to autoimmune disease, such as type 1 diabetes. Unlike T-cells and B-cells, macrophages use phagocytosis and digestion as their principal functions. Macrophages are directed to the site of infection by chemical mediators, such as chemokines and cytokines. These mediators react with surface proteins on macrophages and induce intracellular changes, driving the macrophages to the site of infection. Which of the following is likely true of this form of cell signaling? The signaling system with chemokines and cytokines is an example of a paracrine signaling process, where nearby cells communicate with each other, rather than autocrine signaling, where a single cell releases a signal to itself. The attraction of macrophages to the site of infection must occur quickly, much faster than several days or weeks. It also must use a second messenger, which will likely have immediate cytosolic effects as well as effects on genetic expression, because it acts through a surface receptor on the macrophage. In the above sequence, the unfolded protein sensor binds to unfolded protein, such as the pathogenic amyloid-beta found in the brains of Alzheimer’s Disease patients. This sensor then phosphorylates PERK, or protein kinase RNA-like endoplasmic reticulum kinase. This leads to downstream effects on eIF2, inhibition of which represses translation. It is thought that symptoms of neurodegenerative disease may be a result of this reduced translation. Some evidence shows that the unfolded protein response can be promoted by an inflammatory state. Cytokines are released from cells exposed to stress, thus inducing the unfolded protein response in neighboring cells. Which of the following best defines this process? Paracrine signaling is the communication between neighboring cells, such as the process described in the question. Autocrine signaling is the use of chemical mediators to activate the same cell that secreted the mediator. Endocrine signaling is the use of chemical mediators to communicate with distant cell targets. Isotype is not a form of signal, and refers to similar structures. Autologous tissues refer to tissues taken from the same individual, and is also not a form of signaling. Listed below are events that occur during a signal transduction pathway. Which of the following lists these events in the correct order? Signal transduction involves transmission of signals between cells. In a normal signal transduction pathway, a ligand (such as a hormone and neurotransmitter) binds to a cell membrane receptor on the extracellular side. Ligand binding initiates a response on the intracellular side. One such response includes the binding of the intracellular side to an effector protein. Binding of the receptor to an effector protein releases second messenger molecules that propagate and amplify the signal, often influencing transcription factors and gene expression. There are several signal transduction pathways, but the ligand always binds to the extracellular side of the receptor and initiates a response on the intracellular side of the receptor. Which of the following is true regarding a transmembrane receptor? A transmembrane receptor, by definition, is a molecule that is inserted into a membrane (such as the plasma membrane of the cell). Recall that a membrane found in a cell is made up of a phospholipid bilayer, which contains both hydrophobic (nonpolar) and hydrophilic (polar) regions. The hydrophobic regions are found on the inside and the hydrophilic regions are found facing either the cytoplasm or the extracellular space. To insert into a phospholipid bilayer, transmembrane receptors must have both hydrophobic and hydrophilic regions. The hydrophobic portion of the receptor is found inside the hydrophobic core of the membrane and the hydrophilic iregion s found facing the cytoplasm or extracellular space. A ligand typically contacts a transmembrane receptor from the outside or from the cytoplasm; therefore, the ligand typically binds to the hydrophilic portion of the receptor. A type III secretion system is a mechanism several bacteria use to evade the immune system. They insert a syringe-like structure into a nearby host cell and secrete effector proteins that kill the host cell. What term best describes this kind of signaling? The question states that the type III secretion system involves a bacterium making contact with a nearby host cell. Recall that if a cell makes contact with the nearby cell for signal transduction, then the signal is characterized as a juxtacrine signal. In paracrine signaling, on the other hand, the signaling cell secretes a chemical signal such as a neurotransmitter. This chemical binds to receptors on a nearby cell and transmits the signal; in paracrine signaling the two cells never come in contact. Endocrine signaling involves release of a chemical hormone that enters the bloodstream and signals cells elsewhere in the body. Autocrine signaling involves a cell releasing a molecule that binds to receptors on its own surface; therefore, in autocrine signaling the signaling cell and the target cell are the same. Which of the following is false regarding cellular signaling? A transmembrane receptor is any receptor that inserts itself into a membrane. A cell has a phospholipid bilayer membrane surrounding most of the organelles and the cell itself (the plasma membrane). Transmembrane receptors can be found on all of these membranes because the receptors are essential for receiving signals from the outside environment; therefore, you can find transmembrane receptors on the plasma membrane and on the nuclear membrane. Statement I is true. A prototypical receptor has a ligand-binding site. Once the ligand binds, the receptor signals the cell accordingly. This signal induction can occur via several ways. One way is for a receptor itself to be an ion channel; upon ligand binding the channel opens and transports ions across the plasma membrane, which induces a signal inside the cell. Another way is for a receptor to be a G protein coupled receptor, which induces a signaling cascade that leads to the activation of the second messenger signaling molecule cAMP. There are several ways receptors can induce a signal; therefore, not all receptors are ion channels. Statement II is false. A ligand can be either polar or nonpolar. The classic example is hormones. Recall that there are both polar and nonpolar (steroid) hormones. Polar hormones, such as the ones released from the pituitary, can’t traverse the hydrophobic core of the phospholipid bilayer; therefore, their receptors are found on the plasma membrane. Steroid hormones, released from the adrenal glands and gonads, can pass through the hydrophobic core and enter the cell. Upon entering the cell, the steroid hormone binds to receptors in the cytoplasm or on the nuclear membrane. Statement III is true. cAMP is an important molecule that is part of several signaling cascades. It is classified as a __________ messenger and it can __________ the signal. To answer this question you need to know the difference between a first and a second messenger molecule. First messenger molecules are extracellular molecules such as peptide hormones that bind to the receptor and induce a signal. Second messenger molecules, however, are intracellular molecules that are released and activated by first messenger molecules. cAMP is an intracellular molecule that is activated by signaling from a G-protein coupled receptor; therefore, it is a second messenger molecule. cAMP plays an important role in activation of several signal transduction pathways. An extracellular signal needs to be amplified by the cell so that the signal reaches all of the target regions. Second messenger molecules, such as cAMP, play an important role in this amplification. Which organelle is primarily responsible for ATP production in eukaryotic cells? Eukaryotic cells contain mitochondria. The inner membrane of the mitochondrion houses ATP synthase proteins, which generate molecular energy via oxidative phosphorylation. This is the primary source of cellular energy in the form of ATP. Chloroplasts are another eukaryotic organelle involved in energy production. However, the primary function of the chloroplast is to use light energy to generate glucose from carbon dioxide. This glucose is then metabolized via cellular respiration, utilizing the mitochondria for the majority of ATP synthesis. The force generated by a muscle when it contracts involves muscle proteins within muscle cells, namely actin and myosin. Beginning with the arrival of an action potential from the motor neuron’s axon, muscles generate force through a cascade of electrical and biochemical events. The release of acetylcholine at the presynaptic membrane into the synaptic cleft is caused by the action potential which opens calcium channels. Temporary binding of neurotransmitter at the postsynaptic membrane with the muscle’s acetylcholine receptors leads to depolarization of the postsynaptic membrane and opening of calcium channels. Twisting of tropomyosin to expose myosin attachment sites on actin is the result of calcium released from the sarcoplasmic reticulum and binding to troponin molecules. two strands of protein, myosin and actin, attach to each other by forming a cross-bridge which allows them to slide relative to each other to shorten the muscle and generate force. When depolarization ends, is pumped back into the sarcoplasmic reticulum and actin- myosin cross-bridges can no longer form resulting in relaxation. When a motor neuron is electrically stimulated with a single impulse, a muscle innervated by that neuron produces a force called a twitch. Whereas the impulse might be 1 to 3msec in duration, the twitch is 10 to 100msec long. This is because it takes a long time for the to be pumped back into the sarcoplasmic reticulum. When the rate of impulses is low, the twitches have time to relax (Figure 1A). When the rate of simulation is high, the twitches fuse and the force in the muscle sums (Figures 1B and 1C). 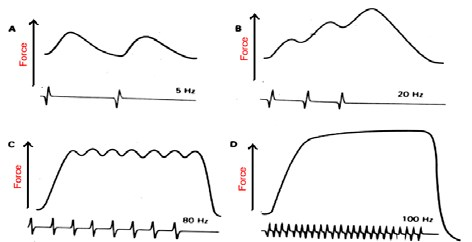 Maximal tension in the muscle, a condition known as tetanus (Figure 1D), is generated when the frequency of action potential is raised to the point when all cross- bridge binding sites are continuously activated and force output no longer shows any ripples. Myasthenia gravis (MG) is a disease in which the number of acetylcholine receptors at the postsynaptic neuromuscular junctions becomes greatly reduced. What is the expected difference between contraction of the muscle of the MG patient and that of a healthy person in response to stimulation by a neuron? This question asks how the response of muscle of an MG patient would differ from the response of muscle of a healthy person to stimulation by a neuron. This is a question that can stand alone from the passage; no information or data from the passage is required to answer the question. When acetylcholine binds its receptor on a muscle cell it produces a depolarization wave that opens channels in the plasma membrane and sarcoplasmic reticulum. As a result, flows out into the sarcoplasm where it stimulates the interaction of actin and myosin and the sliding of the filaments. Since a patient with myasthenia gravis will have a reduced number of functional acetylcholine receptors, the depolarization signal will be smaller, less will be released and fewer actin-myosin cross bridges will form. This sequence of events will result in the weaker contraction in the muscle of the myasthenia gravis patient. The number of troponin molecules bound to tropomyosin does not change during contraction. Troponin is bound to tropomyosin when the muscle is at rest. When is released from the sarcoplasmic reticulum, it binds to troponin and causes it to twist the tropomyosin enough to expose the actin myosin binding sites. Since troponin is bound to tropomyosin at rest and during contraction, there shouldn’t be any difference in the number of troponin-tropomyosin interactions in patients with myasthenia gravis as compared with normal individuals. Both the sympathetic and the parasympathetic nervous systems are essential for homeostasis and for survival. For example, when we are trying to run away from a threat, the sympathetic nervous system is in full effect to allow us to escape from danger. However, when there is no obvious threat, the parasympathetic nervous system tends to be more in control. There are similarities and differences between the sympathetic and the parasympathetic nervous systems. In preganglionic nerve fibers, both the sympathetic and the parasympathetic nervous system utilize the neurotransmitter acetylcholine. Closer to the target organ, the parasympathetic nervous system remains dependent on acetylcholine whereas norepinephrine and epinephrine are the predominant neurotransmitters utilized by the sympathetic nervous system. When norepinephrine and epinephrine bind to their receptors, different effects are carried out based on the type of receptor, affinity, and location of the receptor. For example, epinephrine has a higher affinity for the beta-2 receptor. When epinephrine binds to the beta-2 receptor, common effects include vasodilation and bronchodilation. Norepinephrine has a stronger affinity for the alpha-1, alpha-2 and beta-1 receptors. When norepinephrine binds to its receptor, common effects on the body include vasoconstriction (alpha-1), increased heart rate (beta-1) and uterine contraction (alpha-1). Patient A accidentally overdosed on a drug that activates the alpha-1, beta-1 and beta-2 receptors and is now experiencing a severe asthma attack. Which of the following second messengers should be regulated to treat the asthma attack? During a severe asthma attack, one should administer cpinephrine. Epinephrine binds to the beta-2 receptor. As mentioned in the passage, the activation of the beta-2 receptor will activate intercellular level of cyclic AMP. Cyclic AMP will then activate protein kinase A, which will then phosphorylate various proteins. Therefore, we want to increase cAMP levels, adenylate cyclase activity and decrease phospholipase C activity.